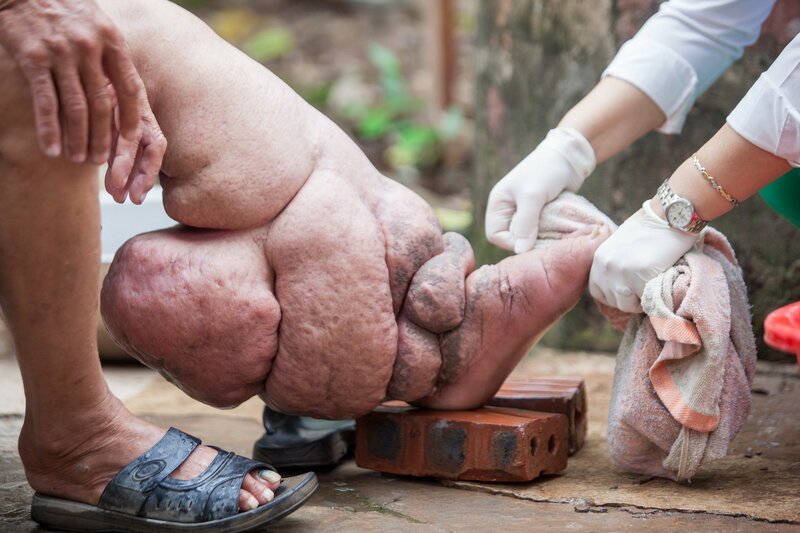 You Probably Know What Elephantiasis Is — But Did You Know There’s No Real Cure? The disfiguring disease lymphatic filariasis (LF) is one of most visible of the neglected tropical diseases. With severe symptoms like swollen limbs and thickened skin, it is commonly referred to as elephantiasis. It all starts with a mosquito bite — or more specifically, with nematodes, a type of parasitic worm that enters the human body through mosquito bites. The lymph fluid normally circulates in the lymphatic system. But when it is blocked, a lymph accumulation causes limbs and the groin to swell to unnaturally large sizes. If left untreated, it can become painful to walk — and even more so to work. For laborers and farmers, this negatively affects their livelihoods as they lose out on employment and wages. Because of its dramatic appearance, people who suffer from the disease often experience stigma and social shame as well. Fachkaluwa Village, Dang, Nepal: Deukala Oli, 46, developed lymphedema from lymphatic filariasis in her left leg six years ago. She says the medication helps with her pain, and has prevented her condition from worsening. In a paper published by the Health and Human Rights Journal earlier this year, nearly all respondents to a survey said they had experienced stigma and discrimination. They reported being shunned, receiving embarrassing stares and insults, or being viewed as inferior on account of the disability. Adult worms can live for six to eight years in the body, producing millions of immature larvae. These circulate through the body via the bloodstream. If a mosquito bites an infected person, it can spread the larvae to another new victim, continuing the cycle of transmission. And yet, as debilitating as LF is, there is no complete cure or vaccine. There are drugs, like diethylcarbamazine, that can kill some of the adult worms and may help prevent transmission from one person to another. But when the worms die, they release a bacteria called Wolbachia that triggers inflammation and can worsen the swelling. It is therefore hard to develop a drug that will get rid of the worms without worsening the symptoms. A patient in Vietnam receives support for limb washing, a critical component of care for those impacted by lympehedema from lymphatic filariasis. While there may not be a complete cure, once the disability is established in individuals, there are things that can be done to counter the disease. Mosquito control is one strategy supported by the World Health Organization (WHO). This can reduce transmission and the spreading of LF. New drug treatments are also being rolled out. In the past, mass drug treatments included the administration of diethylcarbamazine or ivermectin and albendazole. But a new treatment that is currently being piloted in Kenya provides all three medicines in a triple therapy that is resulting in a shorter and more cost-effective program. Thankfully, many countries have recently been able to eliminate this debilitating disease. In October, the WHO announced that three countries — Palau, Vietnam, and the French island territory of Wallis and Futuna — have successfully eliminated LF. These three are added to the 11 nations that were already certified by the WHO as having achieved this milestone. “What You Don’t Know About X” is a new series focusing on neglected tropical diseases (NTDs). NTDs are a cluster of parasitic and bacterial diseases. While you may have heard of a few of them, it’s likely you know very little about their actual effects or why they are so often overlooked. This series looks to shed light on these devastating — and preventable — diseases.